I’m a pretty cerebral romance reader. It’s rare that I read one book by an author that so transports me I can’t write anything intelligent about it, much less two. So when it comes to Alexis Hall’s work, I’m three books in and still struggling to write anything coherent, both because it’s just not how I want to experience these stories and because every time I try, I come out with a 6,000 word blog post (don’t worry–this post isn’t quite that long). There is plenty of meat on these bones. They’re so infernally clever, complex, rich and varied that I want to do them justice. Liberty & Other Stories is a book of short stories set in the same universe as last year’s Prosperity , and there may be differing opinions on this, but I think it doesn’t really work as a stand-alone. It’s comprised of Shackles, Squamous with a Chance of Rain, Cloudy Climes and Starless Skies, and Liberty. I’m focusing on Shackles here because it’s a prequel to Prosperity, the story of Ruben Crowe’s first meeting with Milord. They’re both characters I’m actually rather ambivalent about in terms of my personal feelings, but which somehow doesn’t impact how I experience their interactions. Both characters have limitations in my eyes, which made them wrong for Picadilly, the charming, effervescent narrator of Prosperity, but perfect for each other. Shackles was actually reminiscent of Rumpelstiltskin, the Grimm fairy tale. Both Milord and Ruben Crowe are struggling with identity here, a struggle which continues into Prosperity. Milord is a crime lord who can’t be a crime lord from what is effectively death row. And Ruben feels out of place as a noble and has been defrocked as a priest. We get the sense he’s just…drifting. And the way Ruben repeatedly leaves and returns to Milord in prison recollects the little man returning to the princess each night as she searches for his true name. I couldn’t help but think of Ruben’s desire for Milord’s redemption, which definitely doesn’t happen within the bounds of Shackles and barely happens within the bounds of Prosperity: trying to spin Milord into gold, despite his very straw-like, base capabilities. There are some theological reasons that persistently annoy me about Ruben, but I’m not going to go into that here. Suffice to say, I find it hard to like him, which is actually a good thing. Otherwise, I might have had difficulty with the romance. And Milord is a master manipulator, controlling every move Ruben makes even as he pretends helplessness: both monster and princess. Knowing what’s coming further down the line for them made Shackles all the more interesting because, aside from Ruben not dying at the end, there is little indication here that Milord is in any way redeemable in the way Ruben hopes for. That said, the fact that I have doubts about both Milord and Ruben as people doesn’t diminish my joy at their happy ending in Prosperity. Whether I like them isn’t the point. The point is that they love each other and find a way to make it work, despite their limitations. It’s a subject that seems to be emerging as something of a theme of Hall’s: that everyone, regardless of their worth to society, is worthy of love. It’s also the the perfect foil for the romance that develops between Picadilly and Byron Kae, the aethermancer of the ship that brings all of these characters together: a dramatic, tempestuous thing that highlights the slow-developing, quietly magical quality of Dil & BK’s relationship. And it’s that relationship, the one between Picadilly and Byron Kae, that I’m reluctant to spoil by writing about in depth. So you’ll just have to read Cloudy Climes and Starless Skies, which is one of my favorite stories I’ve ever read anywhere. Ever. I’ve said several times that these two books (Prosperity and Liberty & Other Stories ) would make an excellent doctoral thesis in the future. But they also function as pure narrative: engaging stories that, in your excitement, you’ll either rush to finish or pause to savor. I’d recommend reading Prosperity prior to picking up this volume. There is also a free short available in the same universe which further explores the dreams and desires of a minor character in Cloudy. And since anything to do with Byron Kae appears to be my kryptonite, I can only hope that more Prosperity universe books will be forthcoming, particularly as someone who was once kind to BK, Captain Edward Rackham, comes into focus in Cloudy Climes and Starless Skies and struck me as kinda dreamy. Probably needless to say at this point, I’d be overjoyed for more. Smoked tea is definitely not for everyone. Which sort of makes lapsang souchong the perfect thing for Milord to love and for Ruben to bring him in prison because I think they’re both sort of acquired tastes in their own ways. If you follow me on Twitter, you know that the first iteration of cooking-with-lapsang-souchong didn’t work as well as I’d hoped. I tried several iterations of a sweet, dessert-like thing, but I apparently have odd taste because what tasted divine to me was too strange for everyone else. Lapsang souchong has great body and complexity and was really fun to cook with. Instead of working against its smokiness like in the first recipe, I decided to work with it. And what says smoke more emphatically than BBQ sauce? From my searches online, it’s pretty clear that this is not a new idea. That said, the recipes I saw tended to include things like pears in syrup and grape jelly and store-bought ketchup. Um…yuck. So I just decided to start from scratch. smoker. For the simple reason that I don’t have a grill. Or a smoker. And it’s also January. And 10 degrees outside. Sometimes I really miss California. In the past I have often used smoked sea salt or bacon to give a smoky flavor to meat cooked in the oven, but in the future, I can see myself using a lot of finely ground lapsang. It’s perfect for getting smoky depth without the fat and crunchiness of bacon or the…well…saltiness of salt. than just grabbing a bottle of premade anyway), but since it makes 4 cups, you can freeze it in one cup portions and use it to dress up any grilled or roasted meat. I used it to make baby back ribs right off, which took about a cup and a half along with a spice rub that I’ll also include below. It’s sort of based off an Asian flavor palate too so it would be really good added to ground turkey turning these pork meatballs subs into turkey burgers with quick-pickled radishes, cilantro & jalapeno, but the options are really endless. I think that might be dinner tonight so I’ll post photos to Facebook if it works as well as I hope. But don’t worry about using it up. It’s good enough that you’ll want it on pretty much everything. 1. In a medium saucepan, heat olive oil over medium-high heat. Add diced onions and cook until soft and translucent, approximately 5 minutes. Add garlic and cook for 30 seconds more. 2. While onions cook, combine 6 ounces boiling water with 3 tablespoons of lapsang souchong tea and allow to steep for 3 minutes. 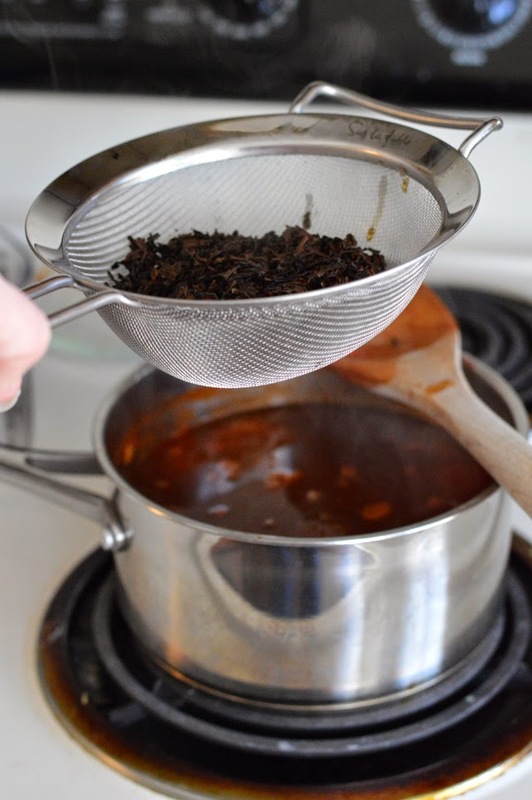 When onions and garlic are cooked, pour the tea through a strainer into the saucepan with the onion. 3. Add diced tomatoes, tomato paste, brown sugar, mustard, sweet chili sauce, soy sauce, crushed red pepper and lemon juice and stir to combine. In a spice grinder or mortar and pestle, grind the remaining 1 tablespoon tea until finely ground, adding 1/2 tablespoon to the sauce. Boil for 20 minutes, stirring occasionally. 4. Using a stick blender or by pouring sauce into a standing blender, blend the sauce until smooth. Taste and add salt and pepper as desired. I used 1/2 teaspoon of salt and 1/2 teaspoon of pepper. Boil an additional 5 minutes to reduce. 1. Combine chili powder, brown sugar, salt, pepper, cayenne, tea in a small bowl and whisk to combine. 2. 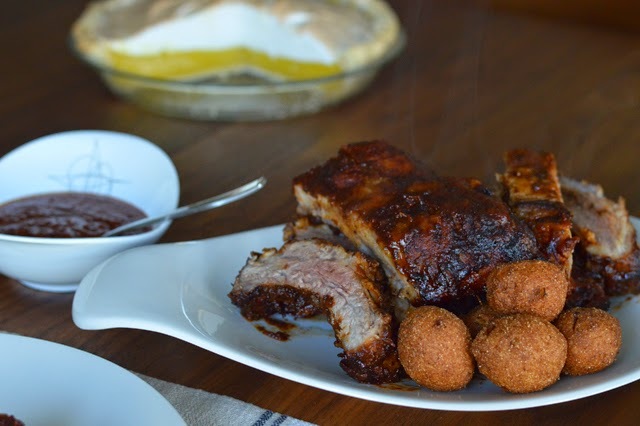 Rub ribs with the spice rub and bring to room temperature on the counter (about 45 minutes). Preheat oven to 400 degrees F.
3. Bake ribs for 30 minutes. Remove from oven and preheat broiler. Baste with 1/2 cup BBQ sauce on each side and broil 3 minutes each side. 4. 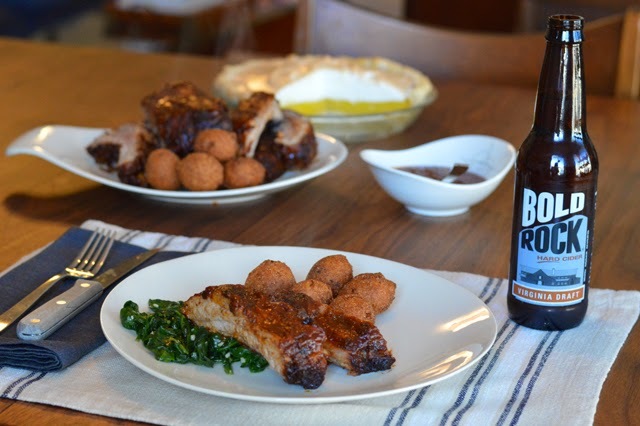 Cut ribs apart and serve with additional 1/2 cup BBQ sauce for dipping. 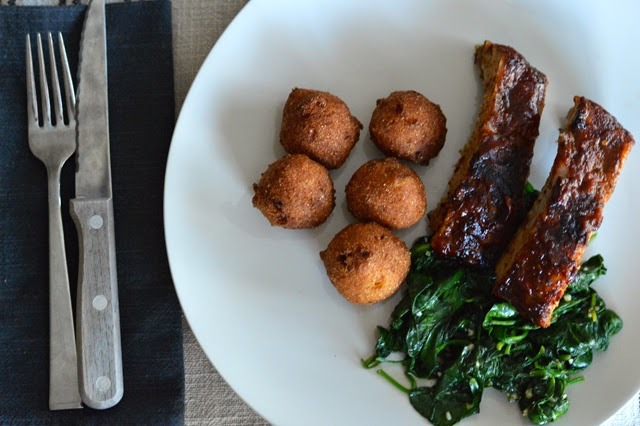 I also made hushpuppies and sauteed garlic spinach, but any kind of traditional BBQ side would be great with these: coleslaw, potato salad, mashed potatoes, cornbread–the options are endless. Disclosure: I received a review copy of Liberty & Other Stories form the publisher and I am friendly with both the book’s author and editor. Oh,wow! I love your review! Hah, do I ever have similar problems trying to review what Alexis writes, but I think you succeeded wonderfully here! "trying to spin Milord into gold, despite his very straw-like, base capabilities." What a great metaphor! and this "It's a subject that seems to be emerging as something of a theme of Hall's: that everyone, regardless of their worth to society, is worthy of love." Yes, yes, so much! He's even said things along those lines himself, more than once I think & that's the heart of what draws me to his work, even setting aside the beauty of the language itself. And oh, I love BK so much too. 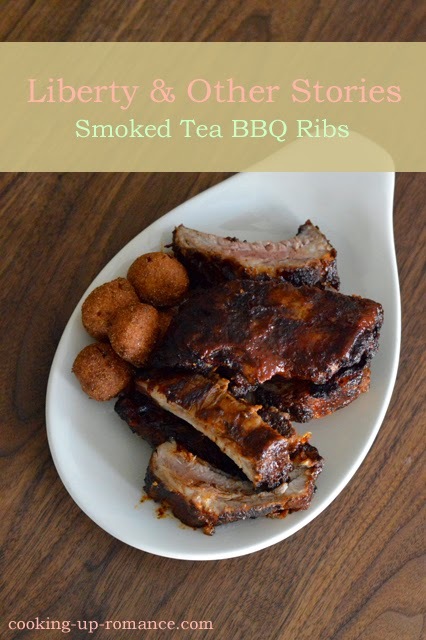 As for your recipe, how inspired, using this smoky tea for barbecue! I can't imagine I'd ever enjoy drinking lapsang souchong, but I might enjoy it this way. The recipe sounds delish! "Taste and add salt and pepper as desired. 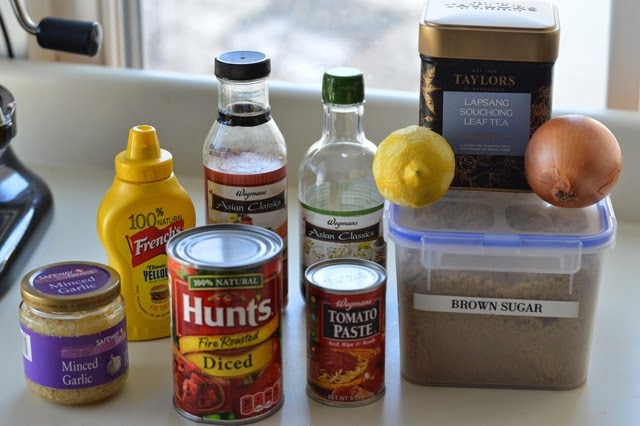 I used 1/2 teaspoon of salt and 1/2 teaspoon of pepper." You are the best. My anxiety over "salt & pepper to taste" is soothed once more. This sounds delicious. And yes, I'm loving Alexis' series, also. Such gorgeous writing. I wear out the highlighter function on my Kindle with his books. nice review—but my eyes are now riveted on those fritters. what are they? can i haz sum? can i haz some NOW??? I do have a post that includes plantain fritters though. Hushpuppies are fine, but OMG those plantain fritters were good.